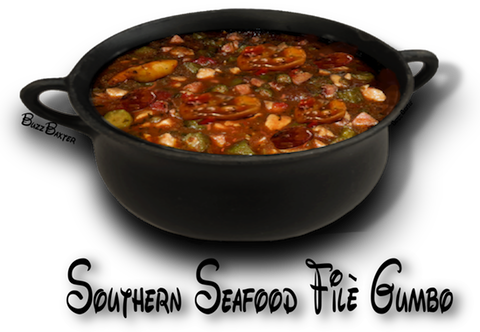 This is the preferred stew of the American South! The seafood in this stew usually varies with the availability of sseafood at the monent. Crawdads, mudbugs or crayfish are a common ingredient as well as shrimp, oysters, whitefish, crab and clams. Andouille or Cajun sausage is often used as well. 1. Combine the stock, ham, bay leaves, red pepper, and 2 teaspoons of the  salt in a large kettle. Heat to rolling boil over high heat. Reduce the heat to a simmer, cover, and cook 1 hour. or the roux is ruined. low and simmer, covered, 1 hour. gumbo filè powder and cook 10 minutes. Check the seasoning and serve over rice. powdered Filè on the side and let the guest add it if they wish.